Hystax made a review of Cloud Migration and Disaster Recovery solutions in today’s fast-growing market for cloud computing. The review indicates that Hystax Acura is a unique true any to any Cloud migration solution on current landscape of migration tools. Hystax Acura provides full automation of the migration process from replication of any types of workloads to an orchestrated launch of test and final migrations to any infrastructures. As a source platform Hystax Acura supports VMware, Microsoft Hyper-V, OpenStack, Microsoft Azure, Amazon Web Services, Oracle Cloud, KVM. Hystax Acura is importantly characterized by an opportunity of migration from any types of workloads including bare metal machines and public clouds. 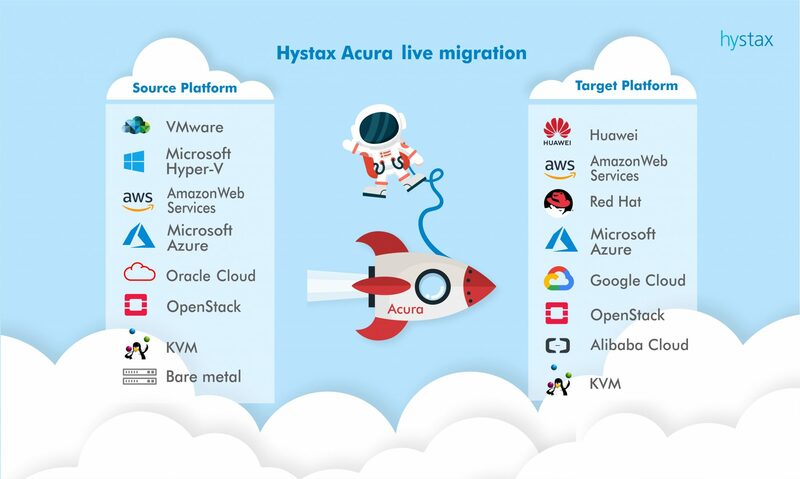 Hystax Acura provides one of the widest ranges of supported target platforms, including Amazon Web Services, Microsoft Azure, Google Cloud Platform, Alibaba Cloud, Huawei Fusion Sphere, VMware, Microsoft Hyper-V, OpenStack, KVM. What are the benefits of cloud migration solution? Hystax Acura is a product that can be used by companies of all sizes: from SMB customers to bring workloads from other public clouds for cost optimization drivers to enterprise customers with complex migration, compliance and downtime requirements. Hystax Acura is a flexible live cloud migration solution that brings companies an opportunity to unlock new capabilities for digital transformation with an automated cloud migration strategy. Hystax is a Cloud migration and Disaster Recovery company with a mission to make a journey to and between clouds a fully managed, simple and straightforward process.